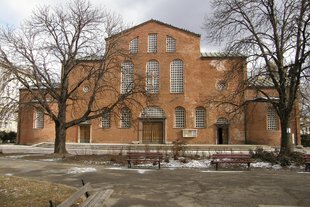 This church is the oldest one in Sofia and it is among the most important churches in South-East Europe. It was built over the remains of old churches from Roman times. It is interesting that church Saint Sofia has no belfry. Its bell was hung on the old tree in front. It is believed that this is in honor of Bulgaria’s liberation from Ottoman rule, as during thanksgiving in meeting Russians in Sofia the bell has been right in the same place. In the garden side of the church is buried the Bulgarian writer Ivan Vazov. Church Saint Sofia is near to many other landmarks such as Saint Alexander Nevsky Cathedral, The President Hall, the National Assembly Hall, the Archaeological museum.